UPDATED: Foreign Minister Børge Brende said on Friday morning there was nothing to suggest any Norwegians had been on board Malaysian Airlines flight MH17 which was shot down over eastern Ukraine on Thursday evening. 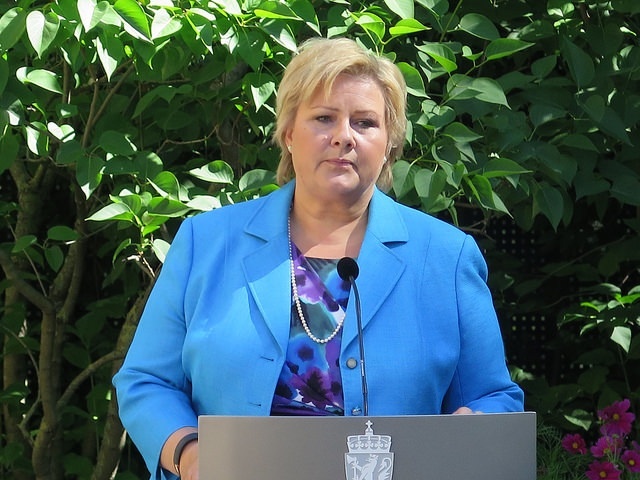 Later on Friday, Prime Minister Erna Solberg expressed her sympathy to the families of the victims, but urged restraint in the “propaganda war” over who was responsible. “I have been in contact with the Foreign Ministry’s crisis team, and they say that nothing suggests there were Norwegians on board, but this is not officially confirmed,” Brende told Norwegian Broadcasting (NRK). All 298 people on board were feared dead. Many of the victims’ nationalities had been confirmed by Friday morning. The passengers included 154 Dutch, 45 Malaysians, 27 Australians, 12 Indonesians, nine from the UK, four Germans, four Belgians, three from the Philippines and one Canadian. He would not be drawn on Norway’s reaction if it turned out Russia had supplied the separatists with the weaponry used to shoot down the passenger plane. “Now we’re into speculation, but if the separatists are behind it, it is terribly serious,” Brende said. Many of those on board flight MH17 were headed to an AIDS conference in Melbourne, Australia. Bjørg Sandkjær, a senior adviser at the Norwegian Agency for Development Cooperation (Norad) and conference delegate said it began with a minute’s silence.